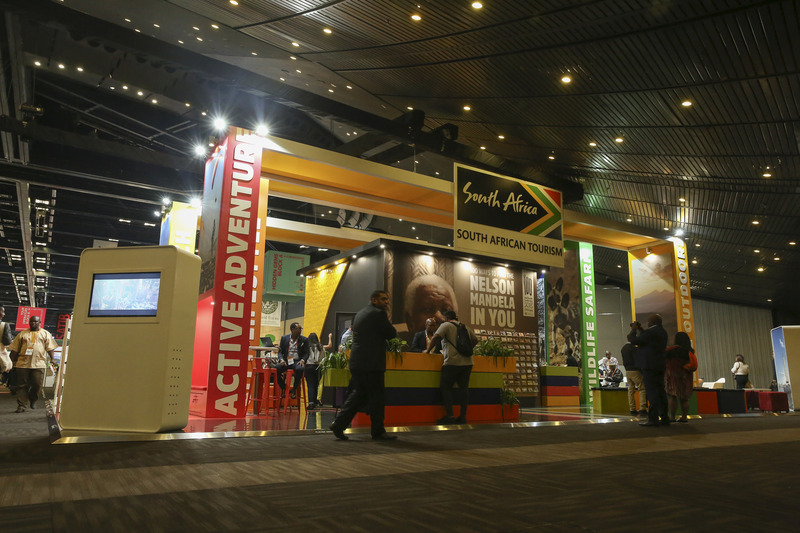 The South African Tourism stand is certainly catching the eye of delegates at Africa’s Travel Indaba with its unique and engaging design. The brains trust behind the design was from Designers Ink, a 100 per cent female owned company. The brief to Samantha Gabriel, Gill Gibbs, Sanele Mbense and Ruhi Kader, was to create a space that captures every kind of experience that can be enjoyed in South Africa. They succeeded in designing a contemporary, interactive stand that at every turn offers something new to see or experience, reflecting South Africa. The stand is practical with interesting attractions that make it stand out, such as the coffee bar, where business and networking meetings can take place. Another interactive feature on the stand is the virtual reality screen that allows delegates to use virtual reality goggles to experience the many attractions that the country has to offer. The centrepiece of the stand this year is a tribute to the Nelson Mandela Centenary. An installation of 100, one of a kind post cards displaying 100 ways to find the Nelson Mandela in you are on display. The postcards are also available for delegates to take home when visiting the stand. “We are very proud of our country and its diversity and are honoured to have partnered with South African Tourism to create this state of the art exhibition stand. “We were briefed to create a design that displays an expression of a country in full colour, with no experience left out,” explained Designers Ink managing director, Samantha Gabriel. “We used our feminine touch to ensure that we pay attention to detail and add distinctive touches to the stand. “We view this opportunity as an excellent profiling platform and are proud of this partnership and endorsement by South African Tourism. “Furthermore, we hope to make even more connections worldwide to expand and grow our business that has now been operating for 17 years. Africa’s Travel Indaba is one of the leading African Travel and Tourism trade shows in the world. Over 1,060 quality tourism, exhibitors from across the African continent are attending and will showcase some of the most creatively designed exhibition stands on the trade floor.